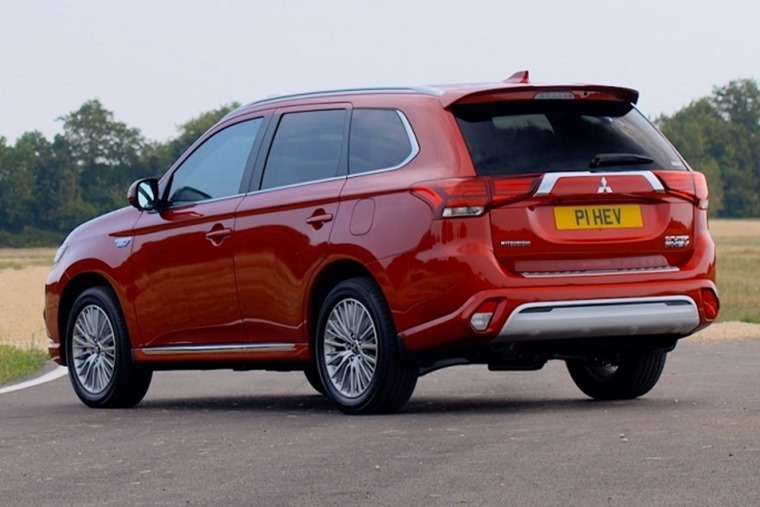 The Mitsubishi Outlander PHEV will never meet everyone's requirements, but for those who value its money-saving nature and potential green credentials, the latest version is as appealing as ever. Just make sure you actually plug it in. Who’d have thought that the best-selling plug-in hybrid car would be a sizeable SUV? 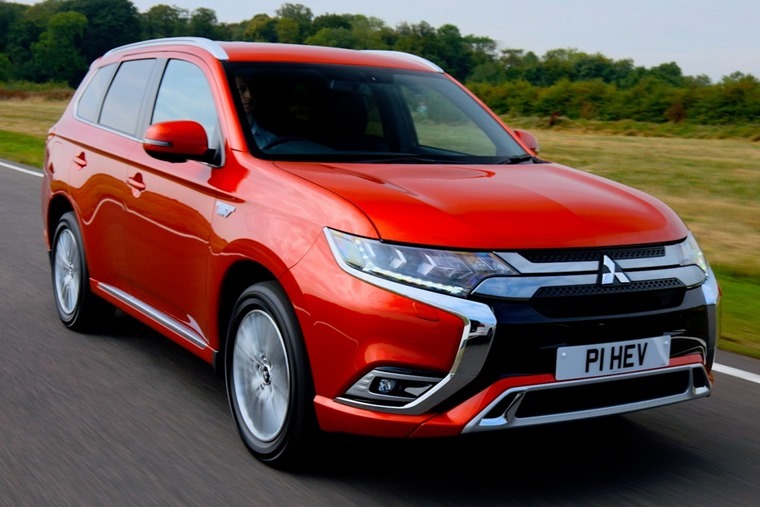 Mitsubishi understood the market when the Outlander first appeared in 2014, combining a 2.0-litre petrol engine with an electric motor and a decent battery pack, creating something that was big and green. Well, a bit green. Actually, some Outlander PHEV drivers rarely plug the car in, so it’s usually driving around using an overworked petrol engine and lugging an empty battery pack and an unused electric motor around with it. That said, tax benefits mean company drivers pay just 13% benefit-in-kind company car. That’s enough to overlook some economy shortfalls, especially if the company is picking up the fuel bill. Thanks to the third revamp in its short life, there’s now reasons to like the Outlander for more than its tax-avoiding abilities. There’s a bigger battery (up from 12kWh to 13.8kWh), a bigger engine (up from 2.0-litres to 2.4 litres) and a beefier electric motor. The result is more power and a longer electric range. Confusingly, the official electric-only range drops from 33 miles to just 28, but that’s a quirk of changes to how these things are now calculated. In the real world, you’ll be a couple of miles better off than previously. It’s more enjoyable on the road thanks to suspension and steering tweaks. The new engine is also more frugal, despite the official economy figures also dropping down to ‘just’ 139 mpg. Having a torquier engine and an improved electric drivetrain allows the car to work less hard, which should translate into fewer fuel stops. It’s more enjoyable on the road, too. 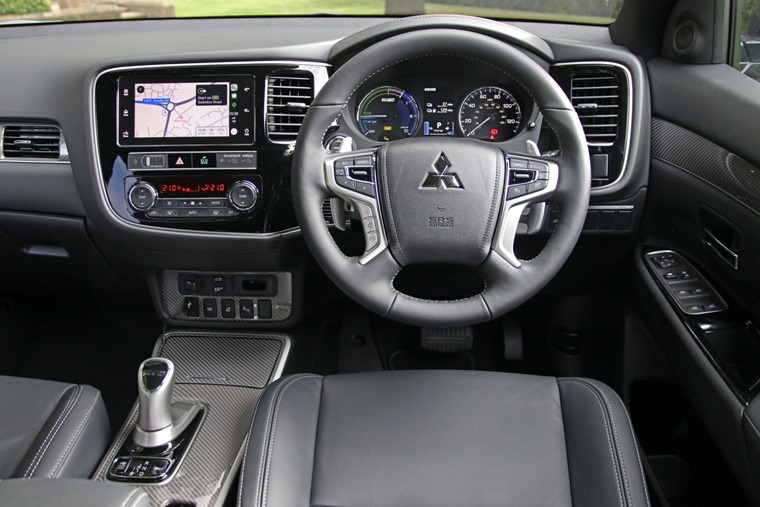 Mitsubishi has strengthened the joints around the car, added new shock absorbers, fiddled with the steering and switched tyres to something a little softer, all of which combine to make the Outlander feel both a little sharper on the road, as well as slightly more comfortable. There’s a new Sport switch that sharpens the throttle response and adds weight to the steering, but it’s rather unconvincing. Ignore it, and just relax in what is a surprisingly comfortable car. It’s quiet too, even when running with that petrol engine, although it does get a tad raucous under provocation. Keep it running on just electricity and everything is calm and relaxed. It’ll manage motorway speeds without switching on the engine, but that eats into range quickly. However, if you commute 20 miles or so to work, can can plug in for a few hours to charge up while you’re there, you’ll be able to do most of your motoring at just a few pence per mile. Then, once the weekend comes round, there’s the flexibility of long distance range thanks to the engine. That comes with a penalty though - petrol power alone means economy is not going to blow you away. Real-world cruising along the motorway is unlikely to see you return even 30mpg, while figures dropping down to high teens are possible. Plug in when and where you can and take advantage of the battery power available and you’ll soon be rivalling a diesel hatchback for fuel use. That SUV practicality makes it a perfect car for a family of small adventurers. Then there’s the SUV practicality, making it a perfect car for a family of small adventurers. Sadly the battery pack and motor eats into boot space, so there’s no seven-seat option, but the boot remains sizeable, and positively cavernous once the rear seats are folded down. There’s plenty of equipment too, although it’s all housed in a rather brittle plastic dashboard. Fake carbon fibre, leather panels in the doors and some chrome highlighting adds a sense of modern luxury, but it jars with the dated switchgear and cheap plastics. 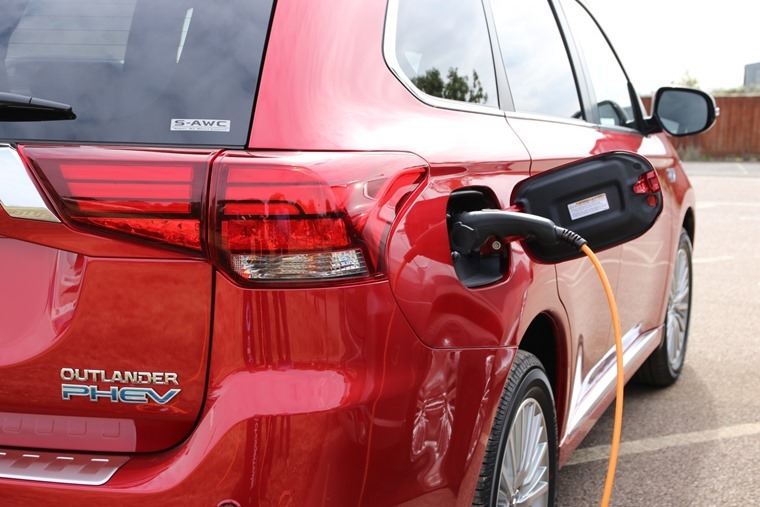 The Outlander itself isn’t realistically good enough to tempt you from your BMW or Audi SUV, but the hybrid powertrain adds an intriguing financial draw. Company owners and company car drivers will save bucket loads in tax, and all will benefit from the relaxed, comfortable feeling the Outlander provides. It’s not a jack-of-all-trades, but does what it does with aplomb and, if you’re exactly the right customer, will do so without costing you much either. The looks haven’t changed much, although a fresh face brings it in line with the rest of the Mitsubishi line-up. It’ll never have the same cache as some other brands though. Impressive infotainment system but a mix of scratchy plastics and some new shiny bits of trim means it lags behind some direct rivals. Generally feels a little bland. Updated suspension and steering along with a new Sport mode improve the car’s dynamics, but this isn’t a car to be driven in a hurry. It’s only available as a five seater and boot space is a little less than you get in a petrol-only PHEV due to the batteries, but the passenger compartment is roomy enough. WLTP tests claim the Outlander PHEV is capable of up to 139mpg, but expect less than this in the real world. The 28-mile electric-only range is great if you only drive short distances, but it’s not usable on longer, motorway journeys.